Twitter is taking the offensive in its ongoing battle online trolls and keep users from being abused. "We're continuing our work to make Twitter safer, moving faster than ever to do so," Ed Ho, Twitter's vice president of engineering, wrote in a blog post. "This week we're introducing additional updates that leverage our technology to reduce abusive content, give you more tools to control your experience, and communicate more clearly about actions we take." Twitter has already moved to make it easier for users to report abusive behavior. Now it is hunting abuse down before it even can be reported. "I like the plan and think it will reduce the abuse that's rampant on Twitter today," said Patrick Moorhead, an analyst with Moor Insights & Strategy. "It appears they are using machine learning to identify abusers before someone flags them or complains about them. This will throttle abusers even before someone will even recognize they are being abused." Once Twitter detects a troll, it will work to limit their reach. "We're taking action by limiting certain account functionality for a set amount of time, such as allowing only their followers to see their tweets," wrote Ho. "For example, this change could come into effect if an account is repeatedly Tweeting without solicitation at non-followers or engaging in patterns of abusive behavior that is in violation of the Twitter Rules. Our platform supports the freedom to share any viewpoint, but if an account continues to repeatedly violate the Twitter Rules, we will consider taking further action." Ho stressed that the company is focused only on accounts that its algorithms prove to be abusive. 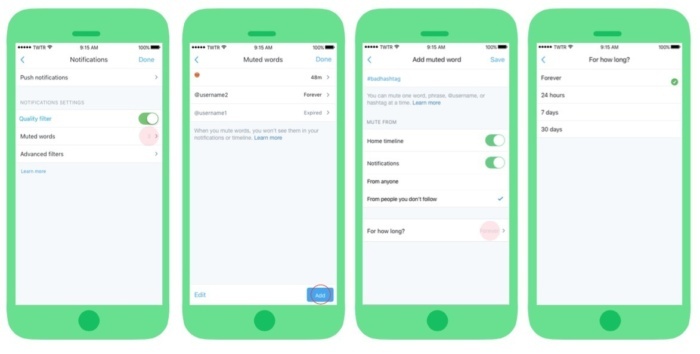 Twitter also is giving users more tools to filter notifications so that they only see those from users that have profile pictures or with verified email and phone numbers. "We're also expanding the mute feature to build on the work we did in November which lets you remove certain keywords, phrases, or entire conversations from your notifications," added Ho. "Now, you'll be able to mute from your home timeline and you can decide how long this content is muted - one day, one week, one month, or indefinitely. This was another big request from you and we're looking forward to rolling it out." Twitter also is looking to communicate more with people who report abuse. For instance, users should now expect to be notified when Twitter receives their abuse reports and if action is taken against the reported account. The messages will be visible in the user's notifications tab. "We're learning a lot as we continue our work to make Twitter safer - not just from the changes we ship but also from the mistakes we make, and of course, from feedback you share," wrote Ho. "We appreciate your patience and support, especially as we roll out these changes globally and in every language represented on the platform in the coming days and weeks." Fighting abusers could help Twitter tackle a problem the company has had growing its user base, according to Moorhead. "I love that Twitter is getting aggressive fighting online abusers," he said. "There are many positives of Twitter, but the negatives are the abuse. I believe this repels many users. It limits Twitter's growth." Zeus Kerravala, an analyst with ZK Research, agreed. "If one high-profile celebrity dumps Twitter because of abusive people, we could see a number of fans stop using it, too," he said. "I certainly think the trolls are intimidating new users from joining. As the problem [of trolls] is likely to get worse, it's good that Twitter is being more aggressive and proactive. Otherwise users could get turned off and leave."